As summertime is coming to an end here in Central Ohio, so are some of summer’s greatest events. Make sure you make the most of your last month of summer by enjoying some of the great things going on in Central Ohio. Here are some events going on in our area this month. Admission: View all ticket prices & admission details here! What: Get ready for the 165th Ohio State Fair! Enjoy a variety of activities and exhibits including interactive educational displays, sporting competitions, a fine arts show, free stages with amazing hypnotists, impressive magicians and wholesome kids’ entertainment, exotic animals in the free petting zoo, a farm animal delivery room, helicopter rides, roving performers, youth agricultural competitions, horse shows, an eight acre natural resources park with free kiddie fishing, wildlife and much more! The Midway features more than 60 exhilarating rides sure to excite you, while Kiddieland is home to rides geared toward parents riding with small children. You won’t be able to resist all your favorite Fair goodies from any of the nearly 200 food vendors. What: Irish attitude is all you need to experience the Dublin Irish Festival in Dublin, Ohio, USA. For 30 years, the first weekend in August has been reserved for what is now the largest three-day Irish Festival on the planet. More than 100,000 guests are expected to attend. With 7 stages, 65 acts and more than 535 performers, there is something for everyone. What: Celebrate the End of Summer at this year’s COLUMBUS SUMMER BEERFEST! Again inside and outside of Express Live!! Get ready for the huge selection of hundreds of Craft Beers from breweries that are down the street & around the country! Plenty of great local food trucks! Live Bands! It’s the biggest craft beer party of Summer! What: GRAMMY Award-winning, acclaimed alternative rock pioneers The Smashing Pumpkins today announced the Shiny And Oh So Bright Tour, their first tour in nearly 20 years to feature founding members Billy Corgan, Jimmy Chamberlin, and James Iha. Produced by Live Nation, the tour will play 36 North American Cities including Columbus Schottenstein Center on Saturday, August 11, 2018. What: Beyoncé and JAY-Z performed six weeks of sold-out stadium dates across North America with their highly anticipated ON THE RUN tour. JAY-Z AND BEYONCE have announced additional OTR II stadium tour dates due to overwhelming demand. Admission: Free! New Fast Pass Options Available Here! What: The Midwest’s largest food truck festival will take over Bicentennial Park, Scioto Mile and the Rich Street Bridge! This is a two-day event featuring over 50-60 of the best food trucks from Ohio and surrounding areas. The festival will feature live music on the Bicentennial Park Stage and our Second Stage located on Washington street on the West side of the river along with family fun for all ages. The foodie feast begins Friday and continues through Saturday evening with great food, live music and special events. If you’re looking for a great way to spend an afternoon, a food lover eager to taste a delicious mix of the best food trucks, trailers & carts in Ohio or a music fan looking to experience the best sounds of central Ohio including national recording artists than the Columbus Food Truck festival is just for you! What: August 19th for its 10-year Anniversary! Enjoy a full day of activities and treats for the entire family – including Fido! WAG! is FUN, FREE and FAMILY FRIENDLY! It’s a perfect day’s adventure for dogs and their pet parents. You’ll find trails to wander, a doggie beach to splash in, where the route to activities leads past appealing booths offering the best products and services for keeping your canine companions strong, happy and healthy. 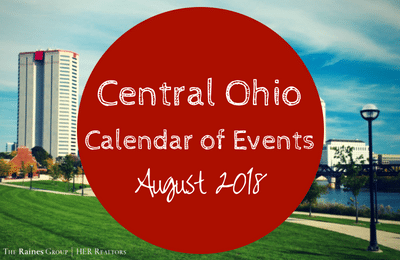 For a full list of things to do in Central Ohio this August visit the Experience Columbus website!